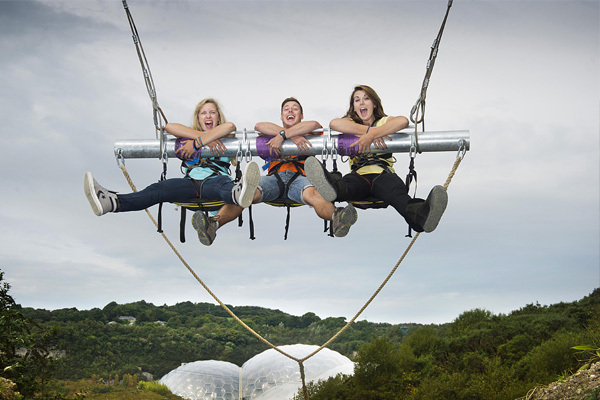 Adrenalin junkies will love Hangloose, Cornwall’s “home of adventure”, which is situated alongside the Eden Project, one of the county’s top tourist attractions. 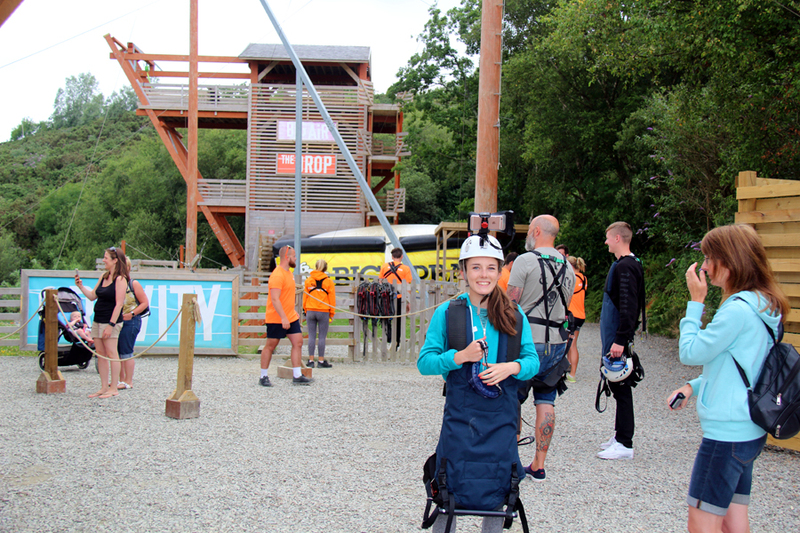 After visiting the Eden Project, we decided to test our nerve at Hangloose, which offers, among other white-knuckle thrills, hair-raising activities like The Drop, Gravity and Skywire. Well, when I say we all decided to test our nerve, I must admit Hollie, who’s 16, participated the most! While Hangloose are introducing three new activities during 2017, the three that were available when we visited were Skywire, Gravity and Big Air. Of course, for safety reasons there are certain limits for these activities. The minimum age is eight and you must weigh between 25-120kg. Certain activities carry additional restrictions and the weather can play a part in terms of the Skywire (a headwind meant my daughter was too light when we visited on the Saturday so we returned first thing on the Sunday, when weather conditions were better, to complete what is England’s longest and fastest zip wire). First of all, Hollie, Peter (who’s ten) and I headed for Big Air, where you leap from a tower onto a big inflatable air bag. There are three different heights. For safety reasons, you have to land a particular way and, to be honest, Peter and I couldn’t get the hang of it. If after three attempts, you’re still landing incorrectly, you’re not allowed to continue to the higher platforms. Hollie, though, was more adept and the only one of us who jumped successfully. Next on the itinerary – well, for Hollie and me – was Gravity. As Hangloose’s leaflet states, “Enjoy the view from 20 metres up, if you can, because before you know it, you’ll be leaving your stomach behind in a breathtaking freefall back to Earth.” It’s a giant swing hoisted 60 feet into the air before being released and, wow, you certainly do leave your stomach behind and feel like you’re going to be flying through the air with the next stop being the Eden Project itself, just below the Hangloose site! 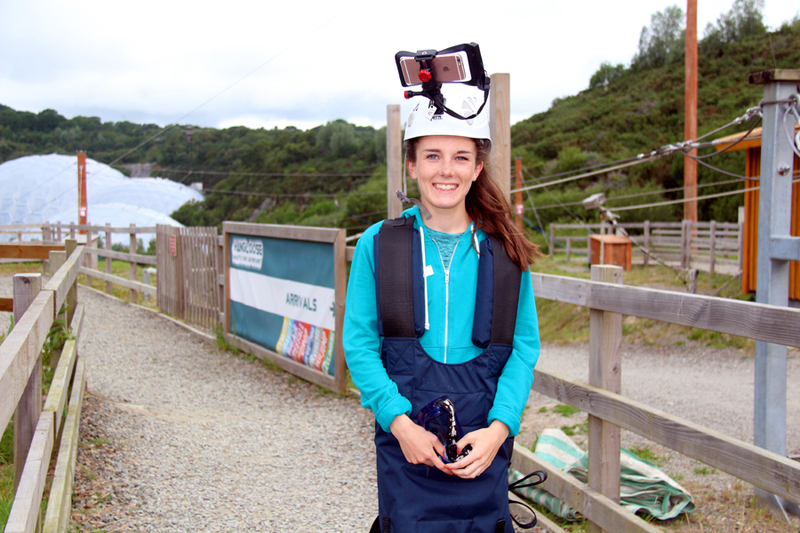 But the highlight of our visit was watching Hollie enjoy the amazing zip wire (unfortunately, Peter was too light and I chickened out at the last moment – well, I had the excuse of needing to film Hollie). In terms of capturing the moment for posterity, Hollie borrowed one of the company’s mobile phone cases which was fixed securely to her helmet and held her iPhone firmly in place. At 660 metres long and 97 metres high, Skywire is, as previously mentioned, England’s longest and fastest zip wire. It certainly provided her with a new perspective of the Eden Project as she flew over the world-famous biomes at speeds up to 60mph. Apparently, it’s been voted among the Top 10 zip wires in the world and Hollie certainly wouldn’t dispute that. It’s worth keeping an eye on Hangloose’s website and Facebook account for details of upcoming events and, of course, for restrictions relating to the current weather conditions. 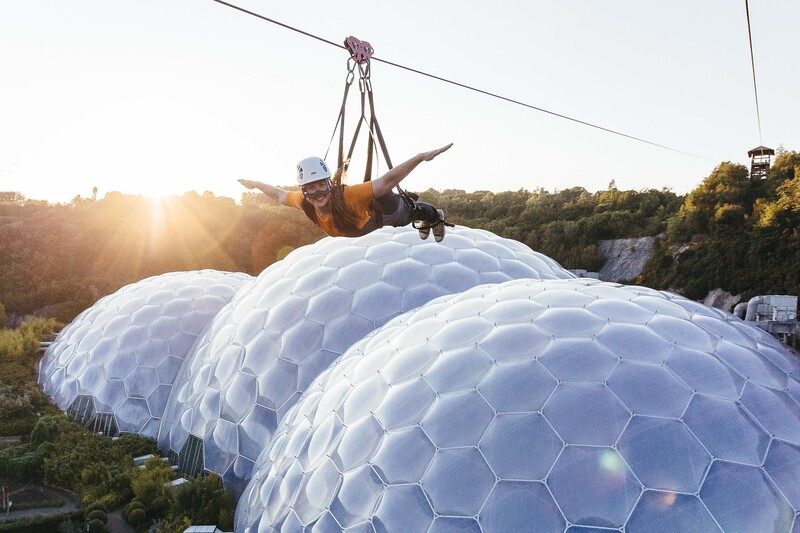 Multi-activity or individual activity packages are available – check the website for further details and costs; also, opening times are recorded on the site and remember that entry to the Eden Project isn’t required to enjoy Hangloose. Overall, it was a fun occasion and we’d recommend it to other families; in fact, we’ve promised to return when Peter is heavy enough to have a go at Skywire.